Incredible look at 42nd Street just after the Civil War. View from School House in 42nd Street Between 2nd and 3rd Avs. Looking North. 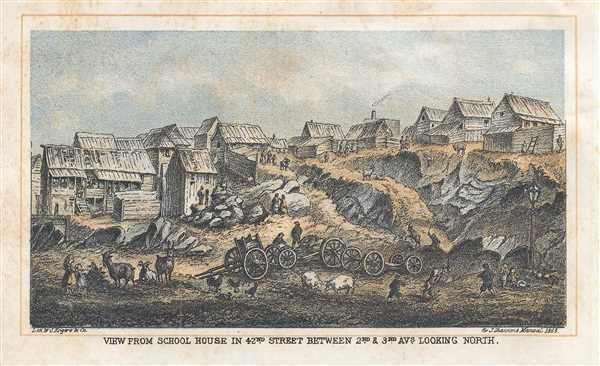 This is an intriguing 1868 Shannon and Rogers view of 42nd Street between 2nd and 3rd Avenues in Midtown East, Manhattan, New York City. The view depicts the neighborhood looking north across 42nd Street. Various farm animals, including goats, pigs, and chickens are visible in the foreground, along with several carts and wagon chassis. Children play in the street below and unlit street lamp while others watch the animals. Across the street, a collection of rundown buildings lines the hill, with what appears to be a multi-family building on the left. Rocks and boulders are strewn everywhere, creating an atmosphere that is completely foreign to today's image of 42nd Street. This view was prepared for inclusion in the 1868 edition of Joseph Shannon's Manual of The Corporation of the City of New York. Joseph Shannon (fl. c. 1850 - 1869) produced a series of New York City almanacs and fact books entitled Manual of the Corporation of The City of New York . Shannon's Manual is very similar to the more common manual issued by Valentine. The production of this annual manual was the responsibility of the Clerk of the Common Council of the City of New York, a position held at different times by both Shannon and Valentine. The manual included facts about the City of New York, city council information, city history, and reported on the progress of public works such as Central Park. William C. Rogers (fl. c. 1860 - 1873) was a New York based lithographer active in the mid to late 19th century. His is best known for his engravings issued in conjuction with Joseph Shannon's Manual of the Corporation fo the City of New York. Rogers issued several maps of New York City in the 1860s and 1870s. Shannon, J., Shannon's Manual of the Corporation of the City of New York, (1868 edition). Very good. Minor staining on margins.Light soiling. Blank on verso.